Adobe Systems Inc. is rolling out several new features to its Adobe Analytics service, helping marketers carve out new trends from their data and analyze data collected from mobile apps. In July, Adobe announced it’d be combining all of its marketing tools into the Adobe Marketing Cloud, including Analytics. However, the new version of the tool is geared towards improving marketers’ response time to all of the data they’re receiving about their customers and their campaigns. “[The updates] are focused on really being able to allow the marketer and analyst to act on their data much more quickly than they used to be able to do in the past. And to do that a lot more accurately,” said Chris Wareham, Adobe’s director of product management, in a webinar last week. Adobe real-time reporting. Click for larger image. 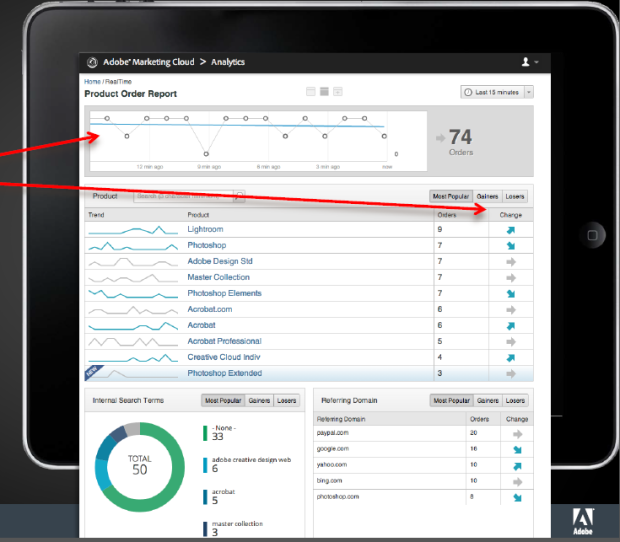 Among Adobe Analytics’ new features is the addition of real-time reporting. That allows marketers, editors, and retailers to see things like how campaigns are performing, which content is getting the most play from readers or viewers, and on-site conversion. Marketers can also see data almost instantly, since the pages can refresh every five seconds. Another new feature is Anomaly Detection, a form of predictive analytics that shows data points appearing outside the normal range of what might be expected. It shows what happened, as well as the magnitude of the difference. That saves marketers a lot of time when it comes to identifying which campaigns and which trends are resonating with their audiences – especially if marketers are trying to keep an eye on more than 10 different kinds of metrics, Wareham said. This also works for retailers who may want to keep track of how different sales or promotions are performing amongst customers, he added. There have also been upgrades to how Adobe Analytics visualizes data, allowing marketers to filter through their data streams. For example, said Wareham, if a florist wanted to check on his or her peak periods during the year, or to check whether certain offers were working, it would be possible to gauge those metrics in seconds, rather than in minutes. Adobe Analytics’ software development kit. Beyond the PC or laptop, Adobe has also ramped up analytics for mobile and for mobile apps. 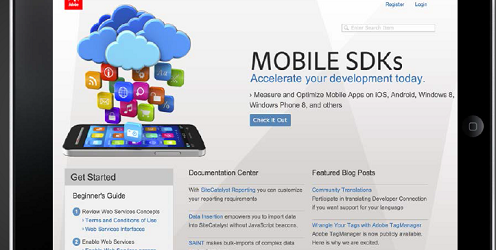 With a new mobile app software developer kit, marketers can analyze data collected from mobile apps. That also includes their customers’ locations when they access their apps, as Adobe has just added GPS location to Analytics. With mobile apps, marketers can see how long users spend inside an app, as well as the actions they take while using it. That helps them improve in-app conversions, since they can start to see trends as to when users buy items after viewing them, or what barriers block them from completing a purchase. And for marketers using video, Adobe Analytics now captures data every 10 seconds for content and every five seconds for ads. That helps marketers figure out when is the best time to run ads, what is the best number of ads they should show, and how long ads should run before viewers stop engaging with them. Adobe’s own team has been using the new features, with team members finding it useful so far, Wareham said. “Adobe, we’re a pretty good-sized business, and we can boil down what’s going on with Adobe.com orders into a pretty compelling single view,” he said. The new updates to Adobe Analytics are free for Adobe Marketing Cloud users. The updates should be rolled out before the end of November.